Since Dad usually tries to get us to do his work for him, this time we’re writing the column ourselves, so we can have our names at the top of the page. And get the money. Ugh, not again. Can’t they see I’m busy? The Playstation won’t play itself, you know. The other thing parents do is make you learn about culture. They always choose a day when it’s really hot and sweaty. You have to be outside on the good days to be inside, and inside on the good days to be outside. And by the time you get home, surprise surprise, it’s the end of the day. And school starts so early here; you have to get up before you’ve even gone to bed the night before. We don’t really mind him writing about us because it makes us famous. When we grow up we’re going to be famous cricketers, or cyclists, or zoologists. But definitely not writers. Because this has taken absolutely ages, and we’ve got things to be getting on with. The Playstation won’t play itself, you know. Noah and Joseph Killeen used to live in Birmingham, UK, but were dragged to Beijing two years ago by their crazy parents. They like sports, video games, and having friends from all over the world. They don’t like the fact that their dad’s biography still says they’re 10 and 7, when they’ve been 11 and 8 for months now. 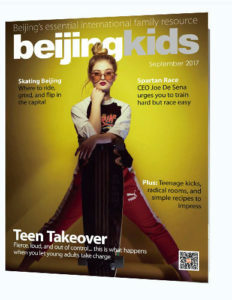 This article originally appeared on p38 of beijingkids September 2017 issue.